There are 4 versions of this aircraft. 1 A None No Power Seat 1 A is a standard First Class Bulkhead seat whose proximity to the lavatory and galleys may be bothersome. 1 B None No Power Seat 1 B is a standard First Class Bulkhead seat whose proximity to the lavatory and galleys may be bothersome. 1 E None No Power Seat 1 E is a standard First Class Bulkhead seat whose proximity to the lavatory and galleys may be bothersome. 1 F None No Power Seat 1 F is a standard First Class Bulkhead seat whose proximity to the lavatory and galleys may be bothersome. 10 A None No Power Seat 10 A is a standard Economy Plus seat. 10 B None No Power Seat 10 B is a standard Economy Plus seat. 10 C None No Power Seat 10 C is a standard Economy Plus seat. 10 D None No Power Seat 10 D is a standard Economy Plus seat. 10 E None No Power Seat 10 E is a standard Economy Plus seat. 10 F None No Power Seat 10 F is a standard Economy Plus seat. 11 A None No Power Seat 11 A is a standard Economy Plus seat. 11 B None No Power Seat 11 B is a standard Economy Plus seat. 11 C None No Power Seat 11 C is a standard Economy Plus seat. 11 D None No Power Seat 11 D is a standard Economy Plus seat. 11 E None No Power Seat 11 E is a standard Economy Plus seat. 11 F None No Power Seat 11 F is a standard Economy Plus seat. 12 A None No Power Seat 12 A is a standard Economy Plus seat. 12 B None No Power Seat 12 B is a standard Economy Plus seat. 12 C None No Power Seat 12 C is a standard Economy Plus seat. 12 D None No Power Seat 12 D is a standard Economy Plus seat. 12 E None No Power Seat 12 E is a standard Economy Plus seat. 12 F None No Power Seat 12 F is a standard Economy Plus seat. 14 A None No Power Seat 14 A is a standard Economy Plus seat. 14 B None No Power Seat 14 B is a standard Economy Plus seat. 14 C None No Power Seat 14 C is a standard Economy Plus seat. 14 D None No Power Seat 14 D is a standard Economy Plus seat. 14 E None No Power Seat 14 E is a standard Economy Plus seat. 14 F None No Power Seat 14 F is a standard Economy Plus seat. 15 A None No Power Seat 15 A is a standard Economy Class seat that may have limited recline due to the exit row behind. 15 B None No Power Seat 15 B is a standard Economy Class seat that may have limited recline due to the exit row behind. 15 C None No Power Seat 15 C is a standard Economy Class seat that may have limited recline due to the exit row behind. 15 D None No Power Seat 15 D is a standard Economy Class seat that may have limited recline due to the exit row behind. 15 E None No Power Seat 15 E is a standard Economy Class seat that may have limited recline due to the exit row behind. 15 F None No Power Seat 15 F is a standard Economy Class seat that may have limited recline due to the exit row behind. 2 A None No Power Seat 2 A is a standard First Class seat. 2 B None No Power Seat 2 B is a standard First Class seat. 2 E None No Power Seat 2 E is a standard First Class seat. 2 F None No Power Seat 2 F is a standard First Class seat. 20 A None No Power Seat 20 A is a standard Economy Plus seat that has extra legroom due to the exit in front however, may also have limited recline due to the exit row behind. There is no floor storage for this seat during take-off and landing. 20 B None No Power Seat 20 B is a standard Economy Plus seat that has extra legroom due to the exit in front however, may also have limited recline due to the exit row behind. There is no floor storage for this seat during take-off and landing. 20 C None No Power Seat 20 C is a standard Economy Plus seat that has extra legroom due to the exit in front however, may also have limited recline due to the exit row behind. There is no floor storage for this seat during take-off and landing. 20 D None No Power Seat 20 D is a standard Economy Plus seat that has extra legroom due to the exit in front however, may also have limited recline due to the exit row behind. There is no floor storage for this seat during take-off and landing. 20 E None No Power Seat 20 E is a standard Economy Plus seat that has extra legroom due to the exit in front however, may also have limited recline due to the exit row behind. There is no floor storage for this seat during take-off and landing. 20 F None No Power Seat 20 F is a standard Economy Plus seat that has extra legroom due to the exit in front however, may also have limited recline due to the exit row behind. There is no floor storage for this seat during take-off and landing. 21 A None No Power Seat 21 A is a standard Economy Plus seat that has extra legroom due to the exit in front. 21 B None No Power Seat 21 B is a standard Economy Plus seat that has extra legroom due to the exit in front. 21 C None No Power Seat 21 C is a standard Economy Plus seat that has extra legroom due to the exit in front. 21 D None No Power Seat 21 D is a standard Economy Plus seat that has extra legroom due to the exit in front. 21 E None No Power Seat 21 E is a standard Economy Plus seat that has extra legroom due to the exit in front. 21 F None No Power Seat 21 F is a standard Economy Plus seat that has extra legroom due to the exit in front. 22 A None No Power Seat 22 A is a standard Economy Class seat. 22 B None No Power Seat 22 B is a standard Economy Class seat. 22 C None No Power Seat 22 C is a standard Economy Class seat. 22 D None No Power Seat 22 D is a standard Economy Class seat. 22 E None No Power Seat 22 E is a standard Economy Class seat. 22 F None No Power Seat 22 F is a standard Economy Class seat. 23 A None No Power Seat 23 A is a standard Economy Class seat. 23 B None No Power Seat 23 B is a standard Economy Class seat. 23 C None No Power Seat 23 C is a standard Economy Class seat. 23 D None No Power Seat 23 D is a standard Economy Class seat. 23 E None No Power Seat 23 E is a standard Economy Class seat. 23 F None No Power Seat 23 F is a standard Economy Class seat. 24 A None No Power Seat 24 A is a standard Economy Class seat. 24 B None No Power Seat 24 B is a standard Economy Class seat. 24 C None No Power Seat 24 C is a standard Economy Class seat. 24 D None No Power Seat 24 D is a standard Economy Class seat. 24 E None No Power Seat 24 E is a standard Economy Class seat. 24 F None No Power Seat 24 F is a standard Economy Class seat. 25 A None No Power Seat 25 A is a standard Economy Class seat. 25 B None No Power Seat 25 B is a standard Economy Class seat. 25 C None No Power Seat 25 C is a standard Economy Class seat. 25 D None No Power Seat 25 D is a standard Economy Class seat. 25 E None No Power Seat 25 E is a standard Economy Class seat. 25 F None No Power Seat 25 F is a standard Economy Class seat. 26 A None No Power Seat 26 A is a standard Economy Class seat. 26 B None No Power Seat 26 B is a standard Economy Class seat. 26 C None No Power Seat 26 C is a standard Economy Class seat. 26 D None No Power Seat 26 D is a standard Economy Class seat. 26 E None No Power Seat 26 E is a standard Economy Class seat. 26 F None No Power Seat 26 F is a standard Economy Class seat. 27 A None No Power Seat 27 A is a standard Economy Class seat. 27 B None No Power Seat 27 B is a standard Economy Class seat. 27 C None No Power Seat 27 C is a standard Economy Class seat. 27 D None No Power Seat 27 D is a standard Economy Class seat. 27 E None No Power Seat 27 E is a standard Economy Class seat. 27 F None No Power Seat 27 F is a standard Economy Class seat. 28 A None No Power Seat 28 A is a standard Economy Class seat. 28 B None No Power Seat 28 B is a standard Economy Class seat. 28 C None No Power Seat 28 C is a standard Economy Class seat. 28 D None No Power Seat 28 D is a standard Economy Class seat. 28 E None No Power Seat 28 E is a standard Economy Class seat. 28 F None No Power Seat 28 F is a standard Economy Class seat. 29 A None No Power Seat 29 A is a standard Economy Class seat. 29 B None No Power Seat 29 B is a standard Economy Class seat. 29 C None No Power Seat 29 C is a standard Economy Class seat. 29 D None No Power Seat 29 D is a standard Economy Class seat. 29 E None No Power Seat 29 E is a standard Economy Class seat. 29 F None No Power Seat 29 F is a standard Economy Class seat. 3 A None No Power Seat 3 A is a standard First Class seat. 3 B None No Power Seat 3 B is a standard First Class seat. 3 E None No Power Seat 3 E is a standard First Class seat. 3 F None No Power Seat 3 F is a standard First Class seat. 30 A None No Power Seat 30 A is a standard Economy Class seat. 30 B None No Power Seat 30 B is a standard Economy Class seat. 30 C None No Power Seat 30 C is a standard Economy Class seat. 30 D None No Power Seat 30 D is a standard Economy Class seat. 30 E None No Power Seat 30 E is a standard Economy Class seat. 30 F None No Power Seat 30 F is a standard Economy Class seat. 31 A None No Power Seat 31 A is a standard Economy Class seat. 31 B None No Power Seat 31 B is a standard Economy Class seat. 31 C None No Power Seat 31 C is a standard Economy Class seat. 31 D None No Power Seat 31 D is a standard Economy Class seat. 31 E None No Power Seat 31 E is a standard Economy Class seat. 31 F None No Power Seat 31 F is a standard Economy Class seat. 32 A None No Power Seat 32 A is a standard Economy Class seat. 32 B None No Power Seat 32 B is a standard Economy Class seat. 32 C None No Power Seat 32 C is a standard Economy Class seat. 32 D None No Power Seat 32 D is a standard Economy Class seat. 32 E None No Power Seat 32 E is a standard Economy Class seat. 32 F None No Power Seat 32 F is a standard Economy Class seat. 34 A None No Power Seat 34 A is a standard Economy Class seat. 34 B None No Power Seat 34 B is a standard Economy Class seat. 34 C None No Power Seat 34 C is a standard Economy Class seat. 34 D None No Power Seat 34 D is a standard Economy Class seat. 34 E None No Power Seat 34 E is a standard Economy Class seat. 34 F None No Power Seat 34 F is a standard Economy Class seat. 35 A None No Power Seat 35 A is a standard Economy Class seat. 35 B None No Power Seat 35 B is a standard Economy Class seat. 35 C None No Power Seat 35 C is a standard Economy Class seat. 35 D None No Power Seat 35 D is a standard Economy Class seat. 35 E None No Power Seat 35 E is a standard Economy Class seat. 35 F None No Power Seat 35 F is a standard Economy Class seat. 36 A None No Power Seat 36 A is a standard Economy Class seat. 36 B None No Power Seat 36 B is a standard Economy Class seat. 36 C None No Power Seat 36 C is a standard Economy Class seat. 36 D None No Power Seat 36 D is a standard Economy Class seat. 36 E None No Power Seat 36 E is a standard Economy Class seat. 36 F None No Power Seat 36 F is a standard Economy Class seat. 37 A None No Power Seat 37 A is a standard Economy Class seat. 37 B None No Power Seat 37 B is a standard Economy Class seat. 37 C None No Power Seat 37 C is a standard Economy Class seat whose proximity to the lavatories may be bothersome. 37 D None No Power Seat 37 D is a standard Economy Class seat whose proximity to the lavatories may be bothersome. 37 E None No Power Seat 37 E is a standard Economy Class seat. 37 F None No Power Seat 37 F is a standard Economy Class seat. 38 A None No Power Seat 38 A is a standard Economy Class seat in the last row of the aircraft whose proximity to the lavatories and galley may be bothersome. 38 B None No Power Seat 38 B is a standard Economy Class seat in the last row of the aircraft whose proximity to the lavatories and galley may be bothersome. 38 C None No Power Seat 38 C is a standard Economy Class seat in the last row of the aircraft whose proximity to the lavatories and galley may be bothersome. 38 D None No Power Seat 38 D is a standard Economy Class seat in the last row of the aircraft whose proximity to the lavatories and galley may be bothersome. 38 E None No Power Seat 38 E is a standard Economy Class seat in the last row of the aircraft whose proximity to the lavatories and galley may be bothersome. 38 F None No Power Seat 38 F is a standard Economy Class seat in the last row of the aircraft whose proximity to the lavatories and galley may be bothersome. 4 A None No Power Seat 4 A is a standard First Class seat. 4 B None No Power Seat 4 B is a standard First Class seat. 4 E None No Power Seat 4 E is a standard First Class seat. 4 F None No Power Seat 4 F is a standard First Class seat. 7 A None No Power Seat 7 A is a standard Economy Plus Bulkhead seat. 7 B None No Power Seat 7 B is a standard Economy Plus Bulkhead seat. 7 C None No Power Seat 7 C is a standard Economy Plus Bulkhead seat. 7 D None No Power Seat 7 D is a standard Economy Plus Bulkhead seat. 7 E None No Power Seat 7 E is a standard Economy Plus Bulkhead seat. 7 F None No Power Seat 7 F is a standard Economy Plus Bulkhead seat. 8 A None No Power Seat 8 A is a standard Economy Plus seat. 8 B None No Power Seat 8 B is a standard Economy Plus seat. 8 C None No Power Seat 8 C is a standard Economy Plus seat. 8 D None No Power Seat 8 D is a standard Economy Plus seat. 8 E None No Power Seat 8 E is a standard Economy Plus seat. 8 F None No Power Seat 8 F is a standard Economy Plus seat. Do you know this plane? Audio Video On Demand (AVOD) available on select aircraft. United provides various audio channels ranging from '80s music to Easy Listening. 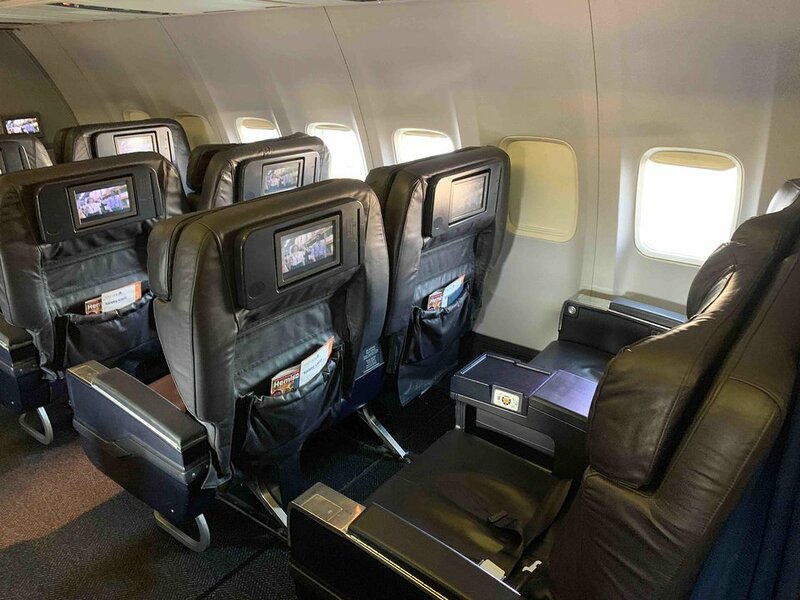 United has installed DirectTV on select 738 Next Generation aircrafts to provide you with over 100 of your favorite TV channels, new release Hollywood movies, and to ensure you will be relaxed and entertained for your entire flight. All First Class and Economy Plus seats have AC power ports which do not require an adapter. On all 738 flights (outside of Micronesia) United Airlines offers internet service. Connectivity is available for laptops or mobile devices. The service is available once the aircraft reaches 10,000 feet cruising altitude. Click here for more information. Non-alcoholic beverages are complimentary. Alcoholic beverages can be purchased in Economy and are free of charge in Premium Cabins (First/Business). Premium alcohol is also available on select flights for purchase. This aircraft has a configuration of 16 First Class seats, 48 Economy Plus seats, and 102 Economy Class seats. United's B737-800 aircraft serve routes within North America. This version features United's current Economy Plus class of service featuring up to 5" of extra seat pitch. AVOID ROW 7!! The bulkhead after Business and in front of the first row of econ plus goes all the way to the floor, making this worse than a regular Economy seat for legroom. The last (fourth) row of First Class has limited-recline seats, despite the "standard First Class seat"" designation on the seat map. All aisle seats have restricted leg room under the seat in front due to positioning of the seat attachment bracket. 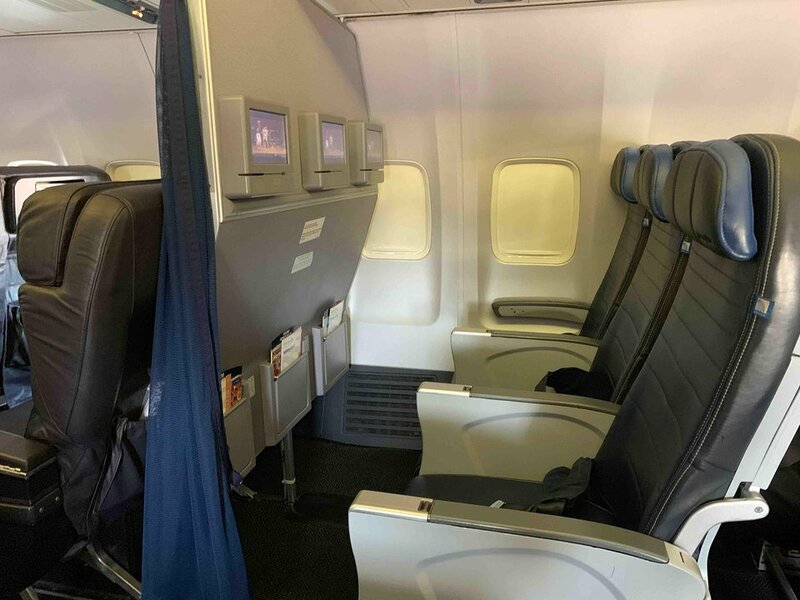 Available space (about 12-14 inches) is narrower than the seat itself and skewed toward the aisle. This prevents the passenger from sitting straight in the seat. Very uncomfortable. Applies to Economy Plus seats as well. This Economy Plus seat is not worth it. The bulkhead directly in front of you means there's no place to stretch your feet or store your bags. While as a technical matter, there might be a few more inches of "pitch" here, there's more legroom in any regular economy seat. And the seat width here is slightly reduced by the in-armrest tray tables. Avoid!! United is now flying these retrofitted Continental?? B737-800 torture machines "overseas"- back and forth between the west coast and the Hawaiian Islands. ? ?The Boeing 737 is the slowest commercial aircraft in the skies, creating a painful 5 1/2 to 6 hour flight, 30 minutes longer than flying on a widebody like Hawaiian's Boeing 767. United isn't alone- Alaska, American, Southwest and Delta all conspire to wedge passengers into these slow slugs on too lengthy of segments. 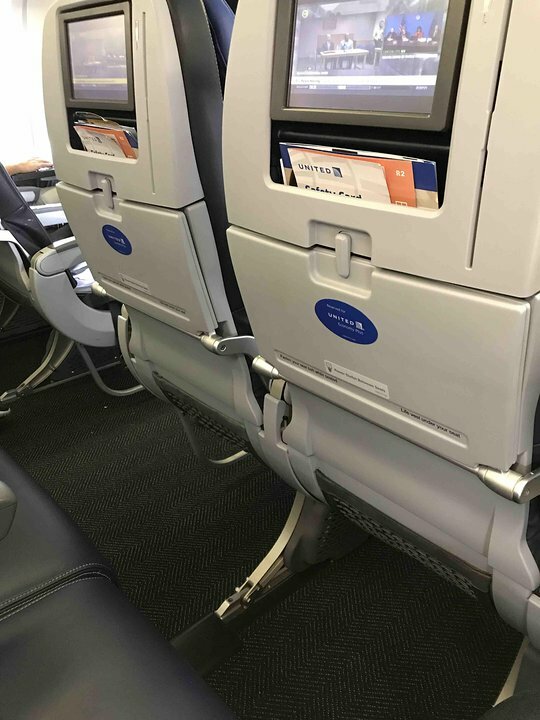 Thanks to Southwest, the single aisle has unfortunately become common with long flights on domestic airlines, but United is one of the few still pulling out 300 pound, solid steel drink carts during the flight, highly restricting access from front to back, sometimes clipping elbows of those somehow sleeping in aisle seats. That is a feat unto itself, as the cheap metal under the floor buckles everytime somebody walks by. 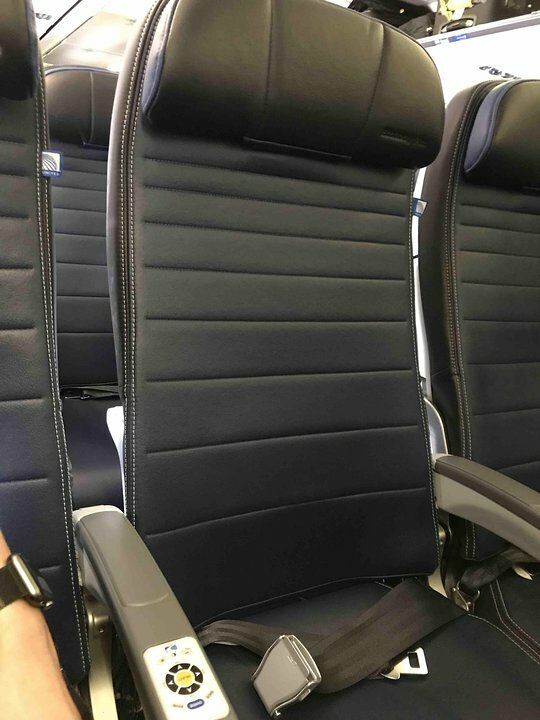 United's "Recaro" seats are the most uncomfortable thing that you'll ever sit on, a chiropractor's dream. Width is an issue- two men shoulder to shoulder don't fit. But the very worst thing was United's (or Continental's) decision to remove the mid-aircraft bathroom, to add even more seats. So there are just two lavs in the far rear for 150 people on a 6 hour flight- one lav for each 75 passengers- who are served beverages three times. Its not nearly enough. They wont allow coach passengers to use the first class bathroom, saved just for the crew and 16 lucky elite passengers. There are lines constantly in back, and the flight crews turn on the seat belt sign at almost any sign of light bumps. The traffic up and down the aisle is constant- and passengers have difficulty fitting past one another without rubbing up against each other or invading the tiny space of the aisle seats. This is particularly ridiculous throughout the last 3 or 4 rows of seats. Advice- fly on a different aircraft for all but the shortest flights (i.e., 2 hours or less). If you get stuck on one of these across the country or to Hawaii, grab a window seat toward the front and don't drink anything. 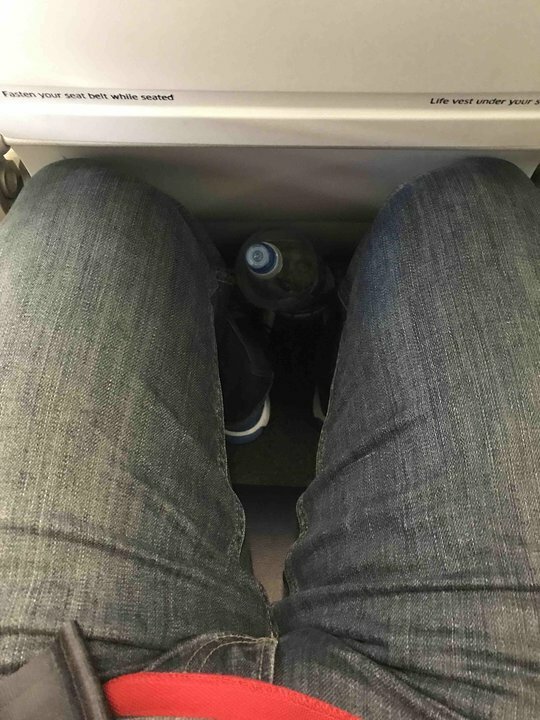 Worst legroom I have ever experienced on an airplane! I have a hard time believing the pitch was even 30". To use my laptop and have the screen angled so I could see it, the keyboard was jammed up to my chest. Only a sadist could have designed this. (FWIW, I'm just 5'10" so no long legs -- can't imagine how someone taller deals with this.) By contrast, the legroom on the other flights I took on this trip -- a CRJ200, CJR700 and B739 -- was fine. Legroom (30" pitch) is the worst I've encountered outside of AirAsia (a budget airline with short flights). United should not be operating 4+ hour flights with equipment like this. This seat seemed pretty nice. It was wide enough and comfortable. There wasn't that much legroom but it was enough and the seat seemed wide enough. United flies 4 versions of Boeing 737-800.